Fulfillment: Giving back to the community and to organizations who are close to my heart. And our vision statement? Financially free Filipinos, one family at a time. It is because of this advocacy that I decided to dedicate a series on featuring my own clients - ordinary Filipinos who are committed to achieving extraordinary feats for their families' future: a financially free lifestyle. In today's blog post, we'll be talking to Dandin, a professor from Quezon City Polytechnic University and his lovely family, Vanessa and Daniel. 1. What's your idea of financial freedom? "Well, financial freedom for me is more than just acquiring a lot of money, or getting rich. It is our ability to do what we want to do without worrying for tomorrow's expenses or obligations. It is a state of being debt-free and with established emergency fund that is why if you want to have a vacation or you want to buy something like car or property, you will not worry that you will run out of funds in the future." 2. Why did you get life insurance - what motivated you to start? 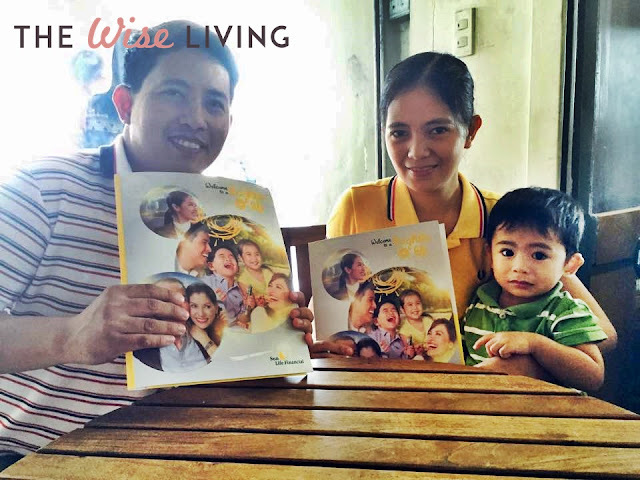 "The reason why I acquired life insurance is because of the uncertainty of the future. I don't want to leave my family with no money to sustain their living if ever bad things happened to me. I want to ensure their future so that if the good Lord will take me, they can still live and sustain their needs." 3. If you could give an advise to your younger self, what would it be? "I think the only advise I would give to my younger self is that he needs to invest the soonest possible time, the younger the better, while premiums are lower." Are you protecting your family, or are you living life recklessly? Protect your family AND invest for the future with a VUL (life insurance + investment plan) like Sun Maxilink Prime.